“Opening Our Eyes: Honouring the Sacred Feminine, Confronting Patriarchy” is a bi-monthly gathering, open to all, focuses on the experience of men in relation to patterns of patriarchy in our culture and in our lives. Select this link for an overview of this series. The following are notes, by Acharya McLellan, from the first gathering. 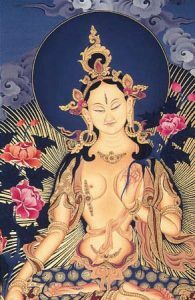 Connect with the healing energy of practice, particularly group practice of White Tara. To convene a community that is interested in exploring the challenging work of personal and social transformation in a gentle and healing way. In particular–male experience and to explore the possibilities of transforming masculinity in our culture. This work is relevant to all genders. According to the Dharma, the most basic and primordial principal is the feminine principal, which is referred to as the mother of all the buddhas. Feminine principle is not sociological, or about identity, gender, or politics. Buddhist iconography: a red triangle, or as the GES, or as Tara, Vajrayogini, Ekajati, Manane, etc. Archetypes of feminine energy in other cultures: White Buffalo Calf Woman, Mother Mary, Parvati, Kuan Yin, Athena, etc. Our aim is to honour this sacred principle, and to honour women. Those two things are both different and connected. Patriarchy is a cultural system that is harmful to everyone. Perpetuated by ignorance. Has eyes to see that which we haven’t been willing to witness. Compassion in all directions. Graceful, gentle and compassionate form of enlightened wisdom. Embracing our learning in an environment of trust, care and relaxed vulnerability. After practice there were two circles: one for men and male identified people (about 7 people), and one for women and all other gender identities (about 20 people). Care for the well being of the whole. Both circles explored the question: what was your inspiration for coming tonight? Exploring gender with Carmella Farahbakhsh. Carmella will lead a conversation, and exploration into re-learning, and re-writing dominant narratives of the gender binary, and the relationship between queerness, transness, racism, and sexual justice. More information on this program series available here.